Looking for a printable lesson plan book? Need something to help your students keep track of their assignments? Check out the lesson planner pages, student agenda book pages, and other printable teaching tools. Organize your weekly lesson plans with these printable "Super Teacher Lesson Planner" pages. Just punch holes in the side, stick them in a binder, and you'll have a great lesson plan book. The "Super Teacher Grade Book" is a printable grading grid to help you keep track of student progress. Just print out the pages, punch holes on the left, and stick them in a binder and you've got the perfect grade book for your class. Send this notice home when students have not completed their homework. When a student needs to refill school supplies, send this notice home. He/she can check off the needed supplies. 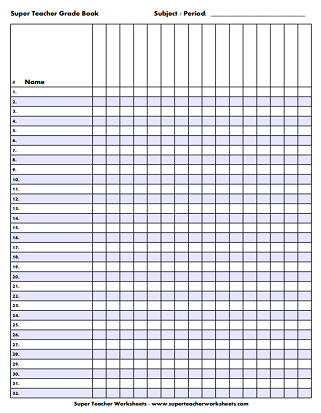 Print the address book and use it to record student and parent names, addresses, and phone numbers. Keep track of parent phone calls, notes, and e-mails with this parent communication record book. Print this note to let parents know about show and tell dates. Going on a field trip? 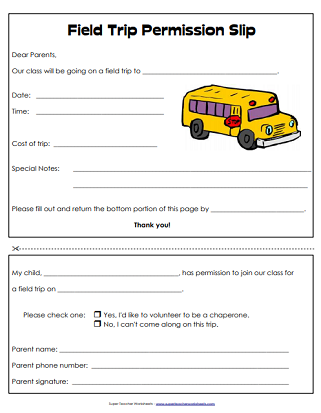 Use this permission slip to let parents know where and when your trip will take place. Keep track of the weather on the daily weather chart. Black and white version. Color version of the weather chart. Invite students to make a colorful birthday timeline that can hang across your classroom. Write your students' birthdays on these birthday cake posters. The pictures are black and white so students can color them in. Write your students' birthdays on the cakes. This poster has color pictures. Write your students' names on the birthday balloons. Color in the chart and add it to your classroom bulletin board. Add your students' names to the birthday balloon charts. This version is in full color. When a student is out sick, use this friendly note to let them know what they missed. When a student is absent, let them know what they missed in school with this friendly note. If a student is leaving on a trip, use this note to list assignments they can work on. First color the pictures on this 15-foot number line. Then hang it above your classroom chalkboard. Print this alphabet line and attach the pages together. Display it over your classroom whiteboard of chalkboard for student reference. The finished product is about 15 feet long. This full-color page has all 26 letters of the alphabet illustrated on primary-ruled paper, and a photo to represent each letter sound. This reference chart can be used to help find equivalent fractions. These bookmarks have standard and metric measurement conversions. Metric include milliliters, liters, centimeters, meters, and kilometers. Standard units include miles, yard, feet, inches, gallons, quarts, pints, and cups. Make your own custom calendar. Choose a month and year, then enter holidays, birthdays, and other important days. Students will love the super heroes that decorate this weekly homework agenda page. Kids will laugh at the cute robots that decorate this homework agenda page. 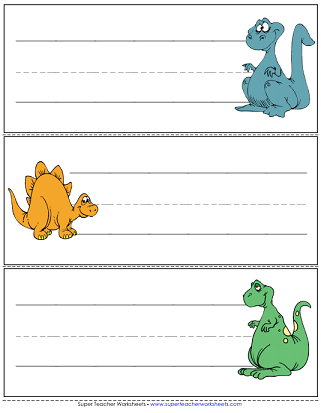 This half-sized agenda (two per page) features friendly dinosaur pictures. Here's another half-sized agenda page with pictures of fish. This is a simple, no-frills agenda page with days of the week listed on it. This student desk tag features printed letters, a number line, and left-right hand prints. This student desk tag features a cursive alphabet, a globe, a multiplication table, and fraction strips. These desk name tags have fish pictures on them. These desk tags have super heroes on them. These desk tags have robots on them. These desk tags have dinosaurs on them. Affix these five-minute interval tabs to your classroom clock to help kids learn to tell time. Tabs read :05, :10, :15, :20, :25, etc. This printable has advanced triangular time tabs. Tabs read five to, ten to, quarter to, o'clock, five after, ten after, quarter after, etc. Tape these oval-shaped tabs around your classroom clock. Tabs have numbers in five-minute intervals, such as :05, :10, :15, :20, etc. These advanced oval tabs read: quarter to, quarter after, half past, ten after, twenty to, five after, etc. Calendars that your students can fill in and color. Lots of award certificates you can use to recognize behavior, achievement, good character traits. Use these fun sticker charts to track reading progress, homework assignments, or student goals. This page has printable reminder bracelets for students. Help them remember to bring back overdue library books, complete late assignments, or bring lunch money to school.